Writer Brad Herzog has had the #2 book on Amazon.com, won $60,000 on “Who Wants To Be A Millionaire”, been interviewed by Matt Lauer and Oprah Winfrey, gets paid every summer to drive around the country in an RV and blog about it, written countless sports and human interest stories as a freelance writer for everything from Sports Illustrated to Cornell Alumni Magazine, authored more than 2 dozen published children’s books and is a critically acclaimed author of 3 travel memoirs, including his latest, Turn Left At the Trojan Horse. Brad Herzog tells us that his unique career was not part of a master plan. Instead, it’s the sink or swim reality of a writing career that has forced him to be creative. In our interview, Brad Herzog shares all kinds of career advice for aspiring writers and writing careers. Brad says it’s incredibly tough to make a living as a writer and doesn’t hide the fact that despite all of his success and excitement, he is definitely not rich. Luck and timing are things you really have to hope for. At the same time, Brad explains, you have to make things happen and make your own luck. Brad got started early – his first paid writing gig was in college. Even though he knew in college that he wanted a writing career, when it came time to choose a college major, he chose psychology instead of English! Brad stresses the importance of confidence for writers. In Brad’s story, you’ll find that his career brings to life most of the 15 Career Development Topics That Will Follow You Through Life! Whether you’re looking to become a published author, have a freelance writing career, a sports writing career, a career writing children’s books, or just an adventurous career in general, you’ll want to watch this interview with Brad Herzog on writing careers! Click here to find Brad Herzog’s books on Amazon.com. Careers Out There Host Marc Luber: Hey everyone welcome to Careers Out There where we help you find a career that fits you. I’m your host Marc Luber and today we’re interviewing a successful writer. He’s going to tell us everything you want to know about several different career paths for writers. He can do that because he’s got a career as a freelance magazine writer, a children’s book author with more than 2 dozen published children’s books, he’s also a professional blogger and a critically acclaimed author of 3 travel memoirs, the most recent of which comes out this month, May 2010. It’s called Turn Left At the Trojan Horse. His name is Brad Herzog. Now you guys know that we want to give you the kind of helpful information that you need to determine whether this is a career path that you want to take seriously. So please leave your feedback in the Comments section below and let us know if we’re covering the stuff the way you want it covered. If we’re leaving anything out, if you want us to focus differently on anything. Also don’t forget to sign up for free with your email address at the top of the home page. Alright – let’s meet Brad Herzog! Brad, welcome to Careers Out There. Freelance Writer & Children’s Author Brad Herzog: My pleasure to be here. Careers Out There Host Marc Luber: So Brad, I want to start by sharing a quote with everyone that’s on the top of your website, BradHerzog.com and it’s a Bob Dylan quote that I think is really great and I think it applies to what we discuss here at Careers Out There. It says, “A man is a success if he gets up in the morning and goes to bed at night and in between does what he wants to do.” You live by that, don’t you? Freelance Writer & Children’s Author Brad Herzog: I do, and I think that’s at least career wise I think that’s just about the most important thing you can do. Maybe in general in life. You know, I didn’t want to fall into a career. I wanted to pursue a career that was right for me, that fit my passions, my curiosities, and wasn’t something that I dreaded doing every day. Because if that’s the case then you’re in the wrong career. So, you know, I really want to make sure that I like – that doesn’t mean that every day when I get up and every day when I go to bed I had the time of my life every day! Of course that’s not the case. But if I can in general be enthused about what I’m doing every day, then I think I’ve made the right choice. Careers Out There Host Marc Luber: That’s excellent. Let’s talk about your latest book – it’s pretty exciting to have a book coming out. Yours is coming out this month – Turn Left At the Trojan Horse. Brad, tell us about the book. What is Turn Left At the Trojan Horse? Guest Freelance Writer & Children’s Author Brad Herzog: Well I’m very excited about it. It’s been about 5 or 6 years in the making and that’s one of the things that we can talk about, about one aspect of my writing career is that it’s not exactly an overnight experience. But I write, I’ve written – this is my 3rd American travel memoir about small town America. What I do is I craft an itinerary that’s going to take me through various tiny little hamlets across the country that fit around a certain theme. And I visit these places, I go off usually alone on the open road for a month or 2 and visit the people in these town and explore the history of these towns, explore my own reflections of them in these towns and insights I gain while I’m there and I craft separate essays about these places and weave together all these elements and these are sort of stand-alone essays but together they form sort of a narrative arc of my journey. It’s creative non-fiction, which is a very challenging genre because it incorporates many elements of different aspects of writing. You have to have the eye for detail of a journalist, you have to sort of have the character development of a novelist, you have to invoke the wordplay of a poet and I sort of have to weave that all together in my books. So in Turn Left At the Trojan Horse, it’s my cross-country journey through Ithaca, New York for a college reunion at Cornell University. In this case it was my 15th college reunion and here I was invited to my college reunion and you sort of take stock of yourself and your life at your college reunion and I sort of learned how heroic has my life been? You know, what constitutes a heroic life? And here I thought well maybe I’ll drive cross-country to Ithaca – I live in California – I’ll drive cross-country to Ithaca to seek out those answers – and I realized the original hero’s journey, the story of King Odysseus in ancient Greece of the Odyssey, which was really the template for all hero’s journeys, whether we’re talking about Star Wars or Lord of the Rings or whatever. That was about King Odysseus returning to Ithaca after the Trojan War. And of all the gods and monsters he discovered along the way, his was really a journey of self-discovery and understanding about the human condition. So that’s what I wanted out of it. So I traveled cross-country to Ithaca, New York and along the way I went through Troy, Oregon and Iliad, Montana and Apollo, Pennsylvania and Sparta, Wisconsin and all these tiny little hamlets and I met heroes along the way: firefighters, a sheriff who saved his town from a tornado, a soldier just back from Iraq who’s on the bomb squad in Iraq, a teacher in a one-room schoolhouse, a lifelong hobo who is sort of the paragon of independence. All these different aspects of heroic life – these attributes that I discovered along the way and hopefully by the end I come to an epiphany of whether I’ve been heroic or not. Host Marc Luber: That’s awesome! Did you feel like you were running for President? Guest Author-Writer Brad Herzog: You know as I travel around, one of the things I’m proudest of when I do these books is that when traveling around I meet, I enter, I immerse myself in so many different subcultures in America. I mean really vastly different subcultures. I went to a tractor pull in Ohio, I went to a dirt track race, I went canoing in the Missouri River with Hobo Dan, all these different people, and I can sort of be accepted in each of these subcultures. And that’s really important for what I do because I sit down with these people often for hours at a time and they tell me their life story and they really start to open up to me and if I wasn’t trustworthy or professional or – if the cynical part of me says I wasn’t a clean-cut Caucasian, I might have had trouble. If I wasn’t someone that they thought they could open up to then they wouldn’t – and I wouldn’t have a story to tell. So there are different aspects of being a writer that go well beyond the actual writing – there are lots of different skills that one must have: research, creativity, but also sort of a professionalism and ability to coax the fascinating nuggets out of people. Host Marc Luber: It sounds fantastic. I love driving across the country – it’s one of my favorite things to do. Hitting all the small towns, just walking around small town America. There’s nothing like it. So I think it sounds great. Everyone – Turn Left At the Trojan Horse – definitely check it out. We’ll have a link – an Amazon affiliate link at the bottom here, below the interview, so look for that so you can get Brad’s book. Brad, tell us when did you know that you wanted to be a writer? Guest Author-Writer Brad Herzog: I think I knew I wanted to be a writer pretty early on. I enjoyed when 4th, 5th grade when we would do creative writing exercises in class, I enjoyed that process. And then when I was in I think in the 6th grade, I read The Hobbit by JRR Tolkein and I was captivated. I, not only the story – the dwarfs and the dragons and what self-respecting nerd doesn’t love that, but also the process – my perception of the process of creating that book, because Tolkein literally started with a blank piece of paper and he created a whole world out of his own imagination – not just the story – he created the languages and history and family tree and timeline and legends and myths and really a whole world called Middle Earth and I was fascinated by the possibility. The fact that you can just use your imagination and create a world out of nothing. And I started to think that maybe some day I would like to try and do that. My case started with a blank computer screen and create a whole world out of my own imagination. So that’s where the spark is lit, but at the time I really mostly liked to write about sports. I was a big sports fan growing up – not necessarily the greatest athlete in the world, but a big sports fan. Especially when you’re starting out, you want to write about what you feel comfortable writing about. I don’t always do that now – in fact, I sometimes seek out the opposite. Now I’m never going to write about the economy. Things that are just way over my head. But if there’s something – a subculture or something of some sort that I’m really clueless about, I might write about it so I can learn all about it. I love that part – the education part or the piece. But at the beginning, try to write about what you’re comfortable with – and I was comfortable with sports. So I always envisioned myself being a sports writer. In fact, my ultimate goal was to write for Sports Illustrated magazine. So the first published article that I ever – the first article I ever had published in the newspaper was when I was about 14 years old for my high school newspaper. For one game, my brother and I were bat boys for the Chicago White Sox. And when I visit elementary schools and talk to students, I tell them the story that – I tell them it’s really important to understand that every time I write something, no matter what I’m writing, I try to tell the story in a unique way. I try to surprise the reader, tell it in an unexpected way – because, if you read my first paragraph and you don’t want to read any further, I’ve failed as a writer. If you read my first paragraph and can’t wait to read the rest, then I’ve done something right. So I always try to surprise the reader a little bit. When I wrote that story about being a bat boy for the White Sox, the way I wrote the story was it turns out the day I was a bat boy the White Sox were in last place. They were terrible. They were the worst team in baseball. However, from that day on that season, they were the best team in baseball and they made it to the playoffs that year. It was a big deal in Chicago. And the day they turned the whole season around and went from worst to best was the day that I was the bat boy. So the article that I wrote in my high school newspaper that was published in the newspaper was about how clearly, unquestionably it was all because of me! When I saw my byline for the first time in a newspaper I was – I thought to myself, I want to see my name everywhere. I really started to think that I want to be a writer. That’s where I really sort of started wondering how do I learn how to write better? How do I learn what do I have to do to make this dream of a profession a reality. I was still obviously pretty young – in high school – but always, from then on in the back of my head I was thinking alright, what kind of writing options are out there. What can I pursue? That’s really when the spark happened for me. Host Marc Luber: And I remember – I haven’t said yet to the audience – we went to high school together and I remember you being known as – you were the writing guy. Guest Brad Herzog: Was I? Host Marc Luber: Yeah! Definitely! 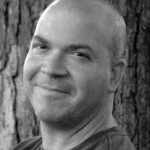 Guest Brad Herzog: I wrote for the school newspaper but I didn’t do that much writing but I did win an award – the National Council of Teachers of English Writing Award and that was supremely important to me because I always tell people that the most important attribute a writer can have is confidence. Because if you have confidence you write with a stronger voice. And you’re a little bit more fearless in what you write and it really makes all the difference. And that gave me a lot of confidence. That made me think, “ok, maybe I am a pretty good writer, maybe this is something I could actually do”. Host Marc Luber: You know, we were lab partners in chemistry class. I don’t know if you remember that. We were the worst lab partners ever because we were both science idiots. And we had no idea what we were doing – we had to look over everyone else’s shoulders to see – how are they doing what they’re doing in lab? Guest Brad Herzog: Speak for yourself, Marc. Host Marc Luber: Ha! Yes! Guest Brad Herzog: Yes, science – I am a right brained person. Science and math, although I did really well in math on the SATs, that type of thing, but I am not a mathematical thinking person. So writing is about the only thing I could have done! Host Luber: So take us now to college. Tell us where you went to college, what you majored in and how the writing developed there so that people watching who are in college can kind of plot their own path. Guest Herzog: Well one thing that’s interesting about me is that I did not choose a college based on writing at all. When I look back on, and I’m very happy with where I went to school, it worked out great for me, I love it, I love visiting there – Cornell University. But I just sort of fell into a college. I applied to 6 schools, didn’t get into 4 of them – Stanford and Brown and Duke, where I really wanted to go – and Penn – University of Pennsylvania I didn’t get in to. I got in to Cornell University, I got into University of Michigan – where Marc Luber went – and where my twin brother was going and all my best friends were going. And I think I guess I got into the honors program there. I didn’t – there wasn’t much of a choice for me, especially because I had a twin brother that was going there. I wanted to sort of create my own identity and much of my life has been predicated on doing something a little bit off the beaten path. So I figured I would go out East to school. I went to Cornell University. Originally I thought about majoring in English, but two reasons why I didn’t were 1 I took a psychology class, Psych 101 that mesmerized me. I thought that’s so cool – I want to learn more about that. It also seemed not so difficult in terms of there were a lot of multiple choice tests, that sort of thing. But also there was a foreign language requirement for an English major that I really did not like. I took a lot of years of Spanish and I now can say about 6 things in Spanish – 6 words – same with Hebrew. And so I didn’t like that so I decided to become a psych major – I still thought I wanted to be a writer but I thought why not study the human mind. That’s not a bad way of going about it either. You can always, you know, writing can mean a lot of different things and the educational path you take toward writing doesn’t have to necessarily mean you have to be an English major. That’s my opinion. Host Luber: OK, good. So at what point did you say I’m going to be a professional writer? Guest Herzog: Well I took a – one of my 2 jobs I had in college – one was I delivered Chinese food – the other, more importantly, was that I worked for the Cornell Sports Information office – where they keep track of all the statistics of the athletic teams and I wrote game programs, I wrote features about players and coaches and games and essentially I got paid to be a sports writer in college rather than me working for the student newspaper where I would have been a sports writer but I wouldn’t have been paid. I got paid, you know, minimum wage to write about sports. And so I got to be around sports, which I still love but at that time I really did love it, and I also got to be around writers which I also realized that I loved and I got to combine the 2. So while I was doing that I thought you know I’m pretty sure I know how to write well, I know how to write quickly if I had to and I really learned that process in college – I learned a very important skill that I still use all the time which is the skill of interviewing people. Asking the right questions. If I write a magazine article or when I write my travel memoirs while I’m traveling across the country and I talk to people in various different places and subcultures around the country, I have to ask really good questions. If I write about famous people – once in a while I’ll write about a TV star or an Olympic athlete whose been interviewed hundreds and hundreds of times and been asked the same question over and over again. If you ask that same question, you’re going to get a boring answer. Famous people tend to be kind of boring because of that. But if you ask them a question that they haven’t heard before, that they have to think about, if they think it’s a good question, you’re going to get a good answer. They’re generally pretty intelligent, insightful people. And I can take that answer and either I can put into my story and make my story better or it could lead my story in a different direction. And I learned that skill, that interviewing skill really in college and I really use that all the time today. So that helped a lot. I also realized that I know how to find the story. If someone said to me in college, they’d say write an article about this hockey player from the Cornell hockey team – you’ve got to find the story there. You have to find that fascinating hook for the story, a fascinating angle. And there could be many options, but you have to find it. And I got really good at finding that story. And again, I obviously still use that all the time today because when I write my travel memoirs, I visit towns where there are 50 people in the town, 29 people, 100 people, 300 people…tiny little towns where there’s almost nothing there and I tell people in the town – hey I’m writing a chapter of a book about your town. And their first reaction is this town? Really? There’s nothing here! But there are hundreds of stories to be told – you just have to find them. That’s one of the most important parts of my job – and really any good writer’s job, whether you’re writing fiction or non-fiction, really. It’s finding what story to tell and then telling it well. Luber: Very good. So what I want to do now, for the benefit of the audience is to take that – what you just said, that discovery of your skill set and talk about how you were able to build on that and build a really unique career. What you’ve done is you’ve really designed your own life. You’ve designed a path that no one else can just go out and apply for. It’s something that you’ve built by piecing together all these different ways that you’ve found to make a career out of your skills. And other people can do that too. So let’s talk about that and then let’s break it down into the children’s books, and the memoirs and each sub-set so that everyone could learn about each of those paths. Guest: Yeah, I’ve crafted – well you know for me it was sort of sink or swim – that’s one of the reasons I crafted my own career. Well, there was a lot of courage involved in it. After I graduated from college, my first job was I was a sports writer at the Ithaca Journal, a tiny newspaper in Ithaca, New York. I was one of 4 sports writers on the staff. I learned a lot because I got to do almost anything I wanted to do. There were days where you would open the paper and there were 6 articles by Brad Herzog – I mean I was an overachiever. But I learned a lot. One thing I learned was I didn’t really love the daily grind of the newspaper. To me, often, especially as a sports writer, it was often just regurgitating information rather than actually flexing my writing muscles. I wanted to be more of a writer than a reporter, if that makes any sense. And I discovered that about myself so that when I was about 24, I left that job. My girlfriend and I were living together in Ithaca, New York. She was a year behind me at Cornell and also at Highland Park High School where we went to school. She graduated and she moved in with me for about 6 months and I quit the job and moved back to Chicago and I became a freelance writer at the age of 24 which is rather unusual because often people become a staff writer for a newspaper or a magazine or an editor. Then after cultivating relationships and working at it for years they then they decide to become freelance writer. That’s often the route people take. Or people become a freelance writer and realize it’s a really hard way to make a living and then they take a permanent job with a regular pay check. I have not had regular paycheck in about 19 years. I decided to bite the bullet and say you know what – I’m going to see what happens. I had started writing a little bit for some magazine – Cornell Alumni Magazine, Sports Illustrated for kids, where I had an internship one summer during collge. I had a relationship there and I started writing for them. I decided you know what – I’ll become a freelance writer and I’ll try and make $300 a month – which is about what happened. Over a decade or so, each year my income would increase by about 20% every year. I started writing more and more, I would get better ideas, I’d cultivate relationships with editors. What I mean by sink or swim is I had to balance art and commerce from the very beginning. As a writer I consider myself as an artist – it sounds a little pretentious, but there is a huge creative part within me that has to be fulfilled. But Ialso I needed to pay the bills – I needed to make a living. I did not become one of those writers, of which we all know, and of which I’m hugely jealous of – they write short stories, they are very literary they go to the Iowa Writer’s Workshop, they become college professors, and they write from a very literary angle. I write from an art and commerce angle, where I had to make a living at it while also satisfying my creative needs. So freelance writing did that. And as I was freelance writing I started to write for Sports Illustrated For Kids magazine, and that sort of got me into children’s writing. I started writing a couple of books for Sports Illustrated For Kids Books. The first one was a collection of sports puzzles for kids. Then I wrote a baseball trivia book, that sort of thing. Luber: I want to stop you there – we should definitely talk about how to have a career in children’s books – but before we get to that, talk a little more about freelance writing since we already started it. If someone’s watching now want and thinking I want to be a freelance writer, whether it’s for sports or music or something totally unrelated. What’s that path like? What is the life like? What is the pay like? How do you get paid? How do you get jobs? Tell us about that and what that’s all about. Guest: It’s not easy. I love the lifestyle, I am my own boss, and I work from home. I live in California, have a tiny little backyard. Everyone’s back yard in California is tiny. In my tiny backyard in a tiny little building is my office – it’s about 10 feet by 20 feet. As a magazine writer my job is to convince an editor that my idea is worthy of a magazine story. Luber: So that editor is being hounded by writers all over the place competing for the same ink? Guest: Yes – and there are lots of tricks of the trade. We don’t have time to go into all of them. For me one of the best things I did was to cultivate relationships with editors. If I get one article in there, I do a good job with it – I’m easy to work with – I’m professional – I write it well – and that will get me a second story, you know? And over the years, when I was really doing a lot of magazine writing, I had a handful of magazines that were my go-to magazines that I would write for. But truly, my favorite part of the job is my ideas. I have two huge filing cabinets in my office that are filled with folders, filled with ideas – or concepts I’d like to write about some day. Whether it’s things I’ve written about in the past that I’d like to re-visit some day or just random ideas I have. I have a file called Other Brad Herzogs – people who have the same name I have. One day that might be an essay – I think I actually wrote a blog about it once – just random ideas. My job is to take my imagination and turn it into ideas – grab those ideas when they come to me – and write a good letter – a query letter it’s called – to a magazine editor telling them what my idea is, why I’m the right person to write it or why I should write for their magazine. So I have to know their magazine well and I have to know the editor well. And I have to write this query letter well and convince them that it’s a good idea. Now I have a really good batting average for my query letters, probably much better than most freelancers I would guess. But that’s really because I write them well and I come up with good ideas. If they know I’m a good writer and I have such a good idea that they can not pass up, it’s just such a good idea, then they’re going to let me do it. Cornell Alumni Magazine is an example – that’s the one magazine I’ve written for for 19 years. The reason is that anything that has to do with Cornell I can write about. I can Google Cornell graduate magician and something will pop up and there might be an article, I can write about a famous magician who is a Cornell grad. To give you some examples, I’ve written articles about Jimmy Smits who is a Cornell grad – the actor Jimmy Smits, a Sesame Street writer that I’ve found. What’s it like to write for Sesame Street? A transgender politician, where if she gets elected – she used to be a man, now is a woman, if she gets elected to the Maryland legislature this year, she’ll be the first ever state-level transgender politician. That’s a great story! How could they possibly pass up that story?! But I had to find that story. I’m just using Cornell as an example – because this is a good example of what freelancers should do – I go through the class notes section at the end of the magazine that says every class and what people are doing with their lives. They write in “I’m a doctor” “I’m a lawyer” – and I find these little nuggets and then I Google them and I find the story. That’s one way I do it. So locating a story is important, and then I have to convince the editor that it’s worthy of their magazine. Then they send me a contract or sometimes, often I’ll work without a contract – in fact usually- which is a little disconcerting – for people who are lawyers by trade, I suggest not being a freelance writer – because you go on a lot of handshakes. So they’ll say OK, we want you to write this story, we need it by May 15th, it should be 3000 words long and we’re going to pay you 75 cents a word. Then I’ll go from there. Luber: Do they have a word limit? Is there a limit there or can you stuff as many words as you want in there? Guest: I wish, there is definitely a limit; it is much easier for me to write long than to write short. It is much easier to write a 4500 feature than a 2000 word feature. I have a lot to say and I learn a lot and I do a good interview and I get all these great quotes and I want to put it all in there – I want to tell my story poetically. And when you have a limit on words, you have to really be sparse with using words and you have to edit and re-edit and re-edit. Usually when I write something that’s supposed to be 3,000 words, my first draft is about 4,500 words. Then I’ll cut it down to 4,000 and then I’ll cut it down to 3,800 and eventually I’ll get it down to 3,000 words or close to it. It doesn’t have to be exactly 3,000 words but it has to be in that ballpark. And then the editors will go through it and they might ask me to change things, or rewrite things or they might say it’s almost perfect. Some editors are very hands-on editors and really almost to a ridiculous extent, you know wanting me to rewrite it a lot. Others are really hands off and might say change this and this but that was great. I usually prefer the latter but it just depends on who you get. But the pay varies considerably. Luber: I was about to ask that. So is it kind of like the publication bases a certain rate per word or is it based on how much experience you have? Do they say – well it’s this much per word if you’ve written for us before, but since you haven’t, you’re worth half of that. How does that work? Guest: Yeah, probably a little of both. It’s not as itemized as you would think like it’s just sort of what they offer generally. You know I wrote an article for Reader’s Digest once and think I got almost $3 a word. So I got about $5,000 for a 1,500 word story. There was a story about my appearance on “Who Wants To Be A Millionaire?” which we can talk about later. But I’ve written for other magazines where I’ll write 1000 words and they’ll pay me $300, so there’s $300 versus $5000. It really varies, it’s hard to get those high paying ones and there have been times where I’ve taken higher paying assignments but it’s something I really don’t care about very much and it’s reflected in my writing. I don’t write as well when I don’t care about it. So it’s hard to cobble together a living with those kind of numbers. Luber: So then that’s something everyone should know! Right? Luber: Is that, should we say this is red magic marker territory – should everyone get out their red magic markers right now? Everyone this is red magic marker territory – Brad is saying it’s hard to scrabble together a living as a freelance writer – but you still enjoy it and it’s rewarding. Guest: Yeah, it’s very rewarding as a lifestyle especially and as a person who is intellectually curious. For me to be able to enter all these lives and look at the world through a writer’s eyes. Where everything I see is fodder for a story. It could be a curse and it could be a blessing, I mean it’s a curse in the sense that it’s hard to get to sleep at night because I’m always thinking. But it’s a blessing because life is always interesting and not only in an intellectually, in an intellectual way but in a just of sort of a day by day way. Anytime a phone rings or an email clicks it could be somebody on the other end saying why don’t you do something interesting. We have an assignment for you or your book is being published or whatever is happening to you that’s really exciting because it’s not sort of the daily humdrum of life. It’s that everyday could bring a new experience for you and I don’t take that for granted at all, that’s all. But it’s real hard. Luber: So if we’re to kind of wrap up. If we’re to summarize the freelance writing path for people, it sounds like- my take away from this is that you’ve got to be able to stay on your toes and always be thinking, always be pooling together ideas, you got to be staying on top of calling the editors and be very proactive about getting gigs for yourself, you’ve got to obviously be a good writer. But you’ve got to be really always on the go. Is that right? Guest: Yeah, you have to be very diligent in pursuing whatever you want to pursue, but you have to be skilled, you have to have a really good imagination. You have to do things and go about it the right way -you don’t want to send ‘to whom it may concern’ letters. You want to find out the name of the editor of the magazine. You don’t want to send an idea to a magazine that isn’t right for that particular magazine. You don’t want to come right from the beginning and say hey I should be writing your main feature for your magazine. You may want to start off by writing the little 300 word features at the beginning of a magazine. Until you get in good with the editors. So there is definitely a process to go about cultivating relationships, cultivating ideas and cultivating your skills as a writer. Luber: Got it, got it and then as far as the struggle you were talking about. What would you say to someone if you can’t handle this then this path of being a freelance writer isn’t for you. What would that be? Guest: If you can’t handle not having a daily, not having a regular pay check then freelance writing is probably not for you. Because I might go months without getting a pay check. I might get six in 1 month and then go 3 months without getting any. And you can’t budget very well because every year is different. Now I’ve had sort of a roughly smooth financial arc to my career. But really every year could be different, it goes up and down. You’re at the mercy of a lot of different things. I was not immune to the economy collapse I can tell you that for sure. And it’s not, you know, I sort of think of myself as a professional golfer which I would love to be by the way. If they don’t do well in a particular tournament they don’t get paid. Whereas a professional baseball player, they’ll get paid even if they’re batting 220. So I’m more of the professional golfer as a freelance writer. But on the other hand I bet golfers enjoy golfing more than baseball players enjoy sitting on the bench and watching a game. So in that sense, I enjoy the unpredictability of it. But it’s very unpredictable. And if you want a life that’s predictable, I would not be a freelance writer. Luber: And so would your advice be to someone who is considering the path of being a freelance writer, would you say you’ve got to diversify what you do? Guest: Well there are 2 ways of looking at it. 2 opposite ways of working on it. One is create a niche where you are an expert at it. I have friends I know people who all they write about is business. Or all they write about is the environment. And they become, they can be pretty successful being that guy or that girl, that woman, who is an expert on that subject. I felt sort of the opposite where I’ve done whatever interests me. Whatever interest me I think it might interest the reader too. So I just sort of find interesting stories. I guess I’m more of a human condition writer and I write about almost pop culture, not pop culture in a Paris Hilton sense but in a sort of, if you read Cornell Alumni Magazine, there might be a story in there about the relationship between the university and the town that it’s in. There might be another one about a new financial aid package at Cornell but then my story might be about the person who writes for Sesame Street. I might be the sort of lighter fare but not necessarily unimportant. I’ve written about very important things like civil rights and health care that sort of things too. But I’ve sort of diversified in the sense that I’ve found interesting stories and gone about it that way rather than being the expert on this or that. I’m no longer just a sports expert – in fact I’m really not an expert on sports. I don’t know much about the Xs and Os of sports. One reason I’m not a daily sports writer any more, I can’t tell you what a three one defense is and a nickel defense and what’s the difference between a slagger and a sinker in baseball – I don’t know. So I shouldn’t really be that kind of sports writer. But I could tell you something about the drama of sports, and the history of sports and different stories of how sports is a map for some sort of fascinating human insight. That thing I can do. So I’ve sort of gone that way instead of diversifying. Luber: Now you mentioned Sesame Street a minute ago so lets run with that for a second because that leads us to children’s books which you brought up earlier and how writing for Sports Illustrated For Kids was what was kind of starting you down that path. Let’s run with that – lets talk about how you have a career, how someone can have a career as a children’s author. Guest: How do I put this without offending other writers? There are published writers out there who take themselves too seriously – in the sense that they think it’s all because of their talent that they’re published writers. My opinion is that half of it is luck and timing. And any writer who doesn’t agree with that I think they’re taking themselves, they’re a little too self important. I think luck and timing play a big role. I happen to know some editors at Sports Illustrated For Kids. One of them started publishing my Sports Illustrated For Kids Books. She went over to MacMilan another publishing company and published my first book for adults when I had a conversation over lunch with her about a book idea that I had. That’s just luck – there’s some cultivating – making your own luck aspects to it obviously. Guest: But I think luck and timing are a big part of it. So children’s writing I started writing for Sports Illustrated For Kids – I don’t find it difficult to write for kids. And what I’ve done with my career is if something is working for me, I’ll keep doing it. Freelance magazine writing kept working for me – so I kept doing it. I started writing for children’s publications and it kept working for me so I started doing that. I found a publisher called Sleeping Bear Press that publishes all these wonderful alphabet books for kids – picture books that are beautifully illustrated on all sorts of subjects: Cowboys, National Parks, every state in the country, China, cats, whatever, dinosaurs. And I knew that they were doing a bunch of sports books and that they wanted to do some sports books and I contacted them at the same time they contacted me – I can’t remember how it happened exactly but we found each other. And now I’ve written 9 books for them. Eight of them are about sports and one is about the environment, called S Is For Save The Planet. So we sort of found each other and I did a good job with my first book. Luber: What age group, when we say children, what age group would you say your books are for? Guest: Well these books are for 5 to 10 year olds. They’re picture books but they have 2 aspects – the title starts with the letter from the alphabet of whatever subject I’m writing about, baseball, H Is For Home Runs, M Is For Minor Leagues and whatever. But on the side of the page are what we call sidebars for older readers – like 3 paragraphs of about 150 words of information so you can grow with these books as you grow as a reader. So it’s a great format – it’s a two-tiered format. Guest: So it’s sort like writing two books in one. And that’s for 5 to 10 year old kids. Children’s writing just like magazine freelancing can mean so many different things. You can write books that are read to kids. You can write middle grade chapter books which I’m going to start doing in the fall – I have a series I did that I’m hatching and hopefully it’s going to be a huge chapter book series about sports and time travel. You can write young adult novels which are huge now. You know those, what they call those vampire books. You know those are – young adult novels are huge now. Within each form of writing there so many different possibilities. And you have to see what you are good at, and what you like and what’s needed in the market. There are many people out there, many, many, many people, who have or want to write children’s books. Most of them I think can do it. But then they’ve got…. Luber: Is it just getting in with the right people? Is that the biggest struggle? Because I’ve know plenty of people who tried to write children’s books and they have not succeeded. Guest: There’s a gauntlet you have to go through. You have to find a literary agent who will help you sell your book. I have, I’m on my 3rd literary agent right now, for various different reasons but I really like this one – she does adult’s books and children’s books. She lives in California, near where I live. I like working with women, so I’m glad she’s a woman. She is very successful. Her – it turns out I found out after I signed on with her that her younger brother was a cabin mate of mine at summer camp in Wisconsin. He passed away soon after which I didn’t know. There was this whole karma thing going on. But you want to find an agent who represents the kind of writing that you want to do. Often the way to find one is to go to a book store and let’s say you want to write a middle grade mystery chapter book – you want to find that kind of a book in a book store or a library. And often in the acknowledgement section an author might thank their agent. So you know that that agent works with that kind of genre, and maybe sort of pursue that agent. It’s really hard to get a response from an agent – it’s really hard to get an address. Even when they are your agent, you are their client – it’s hard to get them responding to you. I’ve had situations with publishers where it’s been a nightmare trying to get them to respond to me. The Sleeping Bear Press I work with for my children’s books – they’re wonderful – they’re like a family. I really like the editors there – I consider them my friends and I’m cultivating ideas with them. It’s really how I envisioned the writer-editor relationship to be – but that’s the exception to the rule. And It can be a very frustrating industry for various reasons: financially, spiritually in a way, all kinds of things. Luber: Let’s run with the financial thing because that’s what everybody wants to know. What can someone make writing children’s books? Guest: It varies, I mean I have yet to make the big bucks, I’ll tell you that. You get an advance – generally how it works is you get an advance against royalties – which means you get a certain amount of money and your book is published and if your book earns enough money to earn out that advance then you start getting paid per book sold. Most of my books with Sleeping Bear Press have at some point earned out the advance but then it hasn’t been a huge amount beyond that. And the advances are pretty small. I mean I could not make a living just writing my children’s books, no way. I mean I could tell you numbers in the sense that it’s, you know, we are talking maybe $5-10,000 dollars for an advance, which is generally what I’ve gotten for all of my books. That’s not a lot of money, that shocks a lot of people actually. I have travel memoirs where I’ll spend a year writing the book and I get $5000 for it. And it’s published and people think “Oh you’re a successful writer” because I have all these books published. But that’s a hard way to cobble together a living. So that’s why I do many different things, that’s why I wear many different hats, not just because I’m bald. Luber: So tell us this how many copies of a book like that need to sell to hit some serious money? Guest: I think once I sell about 10-15,000 books I start getting into the royalty range and start getting paid for books sold. You know, one of my alphabet books, I think H Is For Home Runs has sold over 200,000 copies. But that hasn’t necessarily translated into my wallet so much. Half of those at least were purchased by scholastic and sold at book fairs and that sort of thing. So if that happens every one gets a real low royalty – my royalty rate goes way down for that. So you don’t get a lot with that. I don’t mean to tell a sob story here but I have 9 books out with that publisher and 2 out of my 3 – I get a royalty check every 6 months and 2 of my 3 last 3 checks have been Zero. Not a check! Because my last book hasn’t earned out the advance yet, so it’s a big negative on my ledger that I haven’t paid up with the other sales. And so it’s really hard to – in the past I’ve had royalty checks as high as $16,000 for 6 months. $9,000, $11,000…but lately with the economy the way it is, it’s been close to Zero. I get paid for the books and I’ve got more books coming through them and I’ve got another 6 books in the works right now with that publisher. And so I keep getting them because we have a great relationship, but I’m not going to be breaking the bank. Now – I have friends that I know who they try and get published for years – I know a woman who just wrote a young adult novel and she sold 2 of them for $75,000 bucks a piece. Now that’s a different ball park – I hope to be in that ball park eventually but I haven’t gotten there yet. I am a successful writer in the scheme of things – I’ve got lots of books published and I make a living as a writer – that’s a successful writer – but there’s a difference between being a successful writer and a wealthy writer. There’s a big big difference there. Luber: Right – so again – red magic marker territory –this is something you’ve got to do if you love it. Right? You’re doing this – this is a passion career. This is not – the odds of get rich quick kind of career, not happening so much. Guest: However – there is a process that I discovered a few years ago that, when I started getting into children’s book world, that children’s authors go around the country as visiting authors to elementary schools and libraries and that sort of thing. And they get paid to do it! And it’s a great thing for the kids. I mean if I had a children’s author come to my school when I was in 4th grade I would still remember it today. Of course we never had that…. But I go to schools and talk for the whole day about how I became a writer, how I get my ideas, how a book is made, funny anecdotes, the fun stuff I get to do because I’m a writer….trying to convey all the different forms of writing that there are and that writing can be fun – it shouldn’t be a chore. I say the best way to become a good writer is to be a good reader – to read lots of books. I say all that to the kids – it’s a tough day – I do about 4 hours of talking to everyone from kindergarteners to 6th graders – but I get paid to do that and I’ve done 28-30 a year for the past few years and that’s a great way to add to my finances – and I also feel it’s a pretty noble thing to do to motivate these kids to have a love of reading and learning. So there are ways to sort of make it work but it’s just like being a freelance magazine writer, it’s a scramble. And things don’t come to you, you have to go out after it, right out after them. Luber: Right, right good to know. Let’s dive in to being an author of books for adults. Let’s talk about that – your travel memoirs. How did that come to be? Let’s talk about the RV stuff – that’s very unique. Let’s talk about that. How did it all start? Guest: Well I was mostly writing about sports and I wrote a book called the, my first real book for adults was called the ‘Sports 100’. It was published in 1995 I think. There’s a book out there called ‘The 100’. And it’s a rating of the 100 most influential people in human history, from 1 to 100. # 1 was Mohammad #2 was Isaac Newton, # 3 is Jesus Christ, #10 was Columbus, and Einstein, and Hitler, and Shakespeare and all these people, for better or for worse. I thought it was a fascinating book and I thought I want to do that for sports. So I approached this editor of mine who was at Sports Illustrated For Kids who moved to McMillan and I had told her this idea and she said that’s a great idea. She called me later and said let’s do that book. So I wrote a book called the ‘Sports 100’. The hundred most important people in American sports history – from Jacky Robinson, Mohammad Ali and Babe Ruth to the guy who invented the point spread for gambling, and William Randolph Hearst who invented the sports section of newspaper, the guy who invented the Astrodome, the first domed stadium, that sort of thing. And through that I got an agent, a literary agent who mostly represented athletes and also Sports Illustrated writers. And by the way I didn’t tell you of my magazine writing section that I have written for Sports Illustrated I wrote about 8 or 10 stories as a freelancer for Sports Illustrated over the years and then I realized that’s not the be-all and end-all for me. I want to write about more than that. So I got this agent who wants to represent sports figures and sports writers, and I had this idea to write a travel book about sports called ’52 Pickup’. And the idea was I was going to travel 52 different weekends of the year, I was going to go to a different sporting sub culture and write about it. A soap box derby in Ohio, a rodeo in El Paso, an NBA All-Star game in San Antonio – whatever – and write about how that sub culture related to the sports. Well I couldn’t get that sold, and by the time I found that out, I wanted to travel so much that I wanted to write a book about traveling around the country. So I came up with a much greater idea. And I wrote this book – my wife Amy and I traveled around in 1996 mostly for 10 months in a – we bought an RV – 34 foot RV – drove through 48 states, 35,000 miles in this magical year. And I wrote a book called ‘States of Mind’ about searching for virtue in America. I was sort of a cynical Gen-Xer searching for virtue and I turned that figurative search. So we went to Pride, Alabama, and Harmony, CA and Hope, MS, searching for those virtues in those towns. Is there honor in Honor, MI, can I find justice in Justice, WV? Tiny little towns – in Harmony, CA there are 18 people. In Inspiration, AZ there was nobody left in the town. Glory, Georgia – we couldn’t find the town! And I tripped up my agent by doing that – cause he had never really tried to sell a book like that – and couldn’t sell it – all the New York publishers said no. They said we think it’s really well written and it was the first thing I had ever written but we don’t think it will ever sell. So then I got a new agent because this agent stopped calling me back. Which is something that people have to deal with in my industry. I don’t know, maybe I’m wrong because I don’t know any other industry but I can’t imagine there are other industries where your assigned a client from a publishing company or an agent and they don’t return emails or phone calls. And it happened with me in this industry. Luber: All of the entertainment business – all of it. Guest: I don’t think it happens in a lot of other places. So I got a new agent – a mutual friend of ours – Rob Preskill, who was becoming a literary agent and I was his first client essentially and we sort of learned the ropes together and he got it published by a very small publisher in North Carolina and I got $5,000 for the book which paid for the gas that I spent traveling around the country. But I got a hard cover book about this wonderful year. And then for about 10 months it didn’t sell very well because it wasn’t widely distributed by this regional publisher. And sort of the proxies were true – it wasn’t selling that well. And then I got a lucky break that I sort of made myself. And we could talk about that if you want. Luber: Yeah, I think it’s an amazing story, do it. Guest: At the peak of the phenomenon in April 2000, I somehow ended up being a contestant on “Who Wants To Be A Millionaire?” I mean with Regis Philbin, 29 million people were watching every time it was on TV, it was the #1 show. I found myself in the hot seat with 29 million people watching and I wanted to win a $1 million dollars and I did not win $1 million. I won $64,000 which is real unless you live in California. Luber: I’ve got to tell my part of that story. The fact that you had asked me to be a lifeline for you in case there were any music questions and I said “no” because I was so scared that I would cost you $1 million and I would not be able to live with myself for the rest of my life. And the question when I’m watching on TV – the question was what was the biggest most successful concert tour of all time. And that was the tour that had employed me right when I finished school. Luber: The Voodoo Lounge Tour by the Rolling Stones. So I thought that was just the craziest, weirdest thing. Guest: Yeah I wound up using a music critic from the New Yorker and he kind of didn’t really know that answer, but I guessed it right anyway. I also thought – boy if I could plug my book, that might not be a bad idea. So every commercial break the producer would come up to me and say Oh you are doing a great job, good job. And I would say when is he going to ask me about my book? Because he had a pre- interview card in front of him, Regis did. He knows all about me and he asked all these other questions, but he didn’t ask me about my book. Finally after the $64,000 question he said tell me about your latest book. I described it for 30 seconds. States Of Mind…and I talked about it and Regis said something to the effect of well, if you can’t take the trip at least you can go out and buy the book. And long story short, within 24 hours it was the 7th best selling book on Amazon.com. And that became a news story. Guest: As a writer I’ve learned the hard way that you can’t just let things happen – expecting tings to happen – you have to make things happen. So I kind of made things happen when they happened – I made sure that other news outlets knew what had happened to my book. And that got me stories in USA Today and Time magazine, People magazine. I was on the Today Show for 5 minutes with Matt Lauer, I was on Oprah Winfrey show a month later. I had a crazy month – it actually got up to #2 on Amazon.com literally. Damn Harry Potter, damn wizard. And it was exciting – now did that make me a millionaire? Not even close – because there’s a huge difference between the Amazon.com Best Seller List and the New York Times Best Seller List. Amazon.com meant that a lot of people in a short period of time were buying my book online – which is great. But people hear that story and they think I must have made $1 million off of that and I’m telling you I made maybe $60,000 off of that. So it’s tough to make a living as a writer – it’s tough to sell books. But it did kick my career up a notch and that made me – it did a lot of things for me – I wrote a 2nd travel memoir 5 years later, I’m on my 3rd one now, 10 years later. It’s being published this month. But what also happened after I was on TV a lot and I looked comfortable on TV, I got hired as a spokes person by the RV industry association – the people who make RVs. For eleven summers in a row they drive a brand new RV out to wherever we want to start our trip from – and my family and I go out for two months – we do a 25 city media tour. We do TV interviews in every city – like Good Morning Omaha, Wake Up Tampa, whatever the shows are, and we talk about how much fun we’re having. I get to plug my travel books a little bit – and it’s just another way – another example – just like my school visits as a children’s author – another way that I’ve been able to cobble together a living as a writer. Part of the appeal for me to be on these TV shows is that I’m a traveling author who writes these travel memoirs. Luber: And aren’t you blogging, you’re doing professional blogging on their behalf, right? Guest: I am doing blogging at GoRVing.com, which is a great web site and that’s another way I’ve done it. So over the years I’ve figured out a way year by year to maintain my income while maintaining my self-respect as a writer and sort of merging the two somehow. Whatever is working – so travel memoirs have been sort of working for me too. Now, in terms of how much I’m paid per hour of work it’s ridiculous, it’s a bad idea for me, I’m probably making below minimum wage as an author of travel memoirs. But those are, if anything means the most to me it’s those books – because they’re very difficult to write, very intimate to me – they’re about me. This last memoir, my latest one is a memoir – there’s a lot about my childhood, about me, and people I know, and a lot of introspective things about it. It’s my way to flex my writing muscles. And it’s an example of one thing that I’ve done throughout my career is I’ve done little things to make a living and occasionally I have these pie-in-the-sky things that I try that could maybe somehow get big. And that balance has been very important to me. I think that’s important – I recommend that as a great way to be sort of a freelance writer. To make sure you’re making a living but once in a while be really courageous and try big things and see what might happen because you never know. Luber: Yeah, Yeah, Yeah. Would you agree that on the home page video for Careers Out There, I talk about how when your work is an extension of who you are, it’s actually fun and it doesn’t really feel like work. Would you agree that because all these things, maybe the money is not pouring in and you’re not like you know buying a new house every day, but it’s fun, it’s a piece of who you are. Guest: It’s rare to find that kind of career, I think though – it’s not easy to find that kind of career. But my profession and my person are far more merged than a lot of other people who make it home from work at 5 o’clock, they’re done and they don’t think about it at all. My work and I have sort of grown up together – sort of like my wife and I who met in high school – we sort of became one person as we grew up together. I feel that way about my career too. A lot of who I am is a result of my career and a lot of my career is a result of who I am. If you can make it an extension of yourself and something that you’re passionate about – almost something you would do without getting paid. I mean if you love music then why not try to be a music critic or you know something like that – or whatever your passion might be – but again it’s hard to find careers like that. You know, a lot of people love the law. I know a lot of lawyers who can’t stand being a lawyer. But there are lawyers out there who love the law and are really passionate about it. But you have to do the right kind of law. You have to make sure you keep pursuing the right path that’s right for you rather than necessarily the easy path. I never pursued a path that gave me a track that I could see the future where I knew I was going to get promoted here after 5 years and here after 10 years. That’s really hard that I didn’t do that. But it would be lot harder for me to do that and enjoy what I do – so it’s important. Luber: Exactly, exactly that’s good, that’s good. Alright so you’ve got all these different things that you’re doing, all the different kinds of writing for all the different outlets. But what’s a typical day? Do you have a typical day and does someone like you who is a writer have a typical day? Guest: Some do, some writers like me have very typical days. I’ve read things about writers who wake up at 6 am and write till 10 am then take a walk through the woods and then they go walk the dog and then they do this and that and then they write again from 4 pm to 6 pm that sort of thing. I’m not like that at all. I have to – there’s 2 reasons why – I have to write when I’m in the mood to write whatever I’m in the mood to write. So that doesn’t mean that I’m not working all day – because I have to scramble and do all these different things to make a living, writing is often 10 or 20% of my job. I might go a week and a half without writing a thing but I’ve been working every day. I’ll be contacting schools to try to get school visits. I’ll be setting up interviews. I’ll be planning my RV trip to write my blog for the summer. I’ll be doing all these different things that have nothing to do with writing. And often that is a source of frustration for me because I have to do these things to make…… to cobble together this living. But that also means that there’s no typical day. And I am one of those list makers – I have a day by day list, a ‘to do’ list for things that I have to do. And it will be six days of doing all these little things, like call this person, write that person, email this person back, double check and see if this school’s interested or whatever. And then I might have a six day span which just says write an article about this Sesame Street writer. And I’ll have 6 days to write that. So within those 6 days, that’s mostly what I’ll be working on. But one interesting thing about being a writer is that I work 7 days a week. I feel weird, this is maybe just me, but I feel weird if I go a whole day and I haven’t done a bit of work. It makes me feel weird. So that’s hard sometimes because I might go – I may only work 3 hours on a certain day, where other people work 8 hours shifts somewhere, but I’ll work 7 days a week, and some days I work 15 hours. So it’s unpredictable in that sense but my work is never done. In the sense that I can always be doing something else. I can always be writing another story pitching another story. Or doing some more research about certain subjects. So there is no typical day but it’s definitely typical that there is no day where I’m not doing something. Luber: It sounds like again it goes back to that whole thing of your work being an extension of who you are – that’s what makes that OK. Because if some boss was saying you got to do this and you are doing it 7 days a week, you’d probably jump out a window. Guest: Right, I think a really important skill that a freelance writer has to have is self-discipline. Don’t get me wrong, I can be a world class procrastinator. I am probably the best online Scrabble player in the history of the world. However..
Luber: You might be challenged by our viewers. If we have viewers! You can get challenged! Guest: OK, I’m probably not the best. I’m also really good at Facebook! But that’s just to give my brain a little bit of a rest. Because when I’m writing, it’s intense. My job – the actual writing part of my job is not something you can just phone in – you have to be really focused on it when you are doing it because – especially when I’m writing a book or a complicated article, magazine article, I’m sometime hard to live with for a few days because all that stuff is rumbling around my brain and there’s this – I’m trying to organize it in my head over a matter of days and I don’t want to forget this, and I don’t want to forget that, and it’s all in there – so it’s a really intense few days sometimes. Luber: So focus and self discipline – what are other skills that people need to have other than being a good writer that you would suggest. Guest: You need to have good research skills. If I’m doing a 3 page magazine article about a subject I’ll do enough research to fill 10 or 15 pages. And then I could pick and choose the interesting nuggets that I could put and make my article much more interesting. I don’t want to have to write an article where I’m scraping the bottom of the barrel trying to get some fact to fill my 3 pages- that is not a very good story. So lot of research. I’m not the best at research but I’m really good at Google research – and finding things, story, magazine articles, newspaper articles about a subject that often lead me in a certain direction. So research is very important. As I said earlier interviewing skills are very important. Asking the right questions. And also people skills. There are in 2 different ways. # 1 is when you are dealing with editors. Oh, 3 different ways actually. When you’re dealing with editors, you want to be likeable- you want them to want to work with you again. It’s just like being an actor who is always going for auditions. I recently wrote an article about an actor, a character actor in Hollywood, a very interesting guy, nice guy. And he said when he goes for an audition he’s not trying to schmooze the producers or whoever …. the casting director. He just wants to go in there and he wants them to think, ok, this guy can do the part, say his line, and he’s not going to be one more headache that I’m going to have. Luber: Hey! you know that’s exactly, I believe the very first interview posted on Careers Out There- is an interview with a session musician and he’s a cellist. He plays the cello on rock albums, on dog food commercials, on anything. He just plays the cello, and he goes to the studio and he walks in with his cello and sometimes it’s Dr. Dre using him for a rap tune, sometimes it’s Green Day, you never who it’s going to be. And they say we want you to do your thing on this piece of music. And he said exactly the same thing – he said you want to be the nice guy in the room. You want to be the one who – you know you don’t rock the boat. You come in and you do your thing and you walk out and they want you back because you helped keep that vibe right in the room. Guest: You don’t want to be a diva in any way. And – they have so many headaches that they’re going to have to deal with. You don’t want to add one more to that list. So they want to know that you will be easy to work with – that’s one people aspect. The other one is meeting people and writing about them. If they don’t really like me, if they don’t like the questions I’m asking, it’s not going to be a good interview. And often there’s a trick to that – if I have some rather touchy questions that I want to ask, I’ll save those for toward the end of the interview. I’ll make sure we have a good rapport, and then I can ease in to that and it’s less confrontational that way. So there’s people – being a people person that way too. The 3rd aspect of being a people person is the fact that I have to promote myself in many different ways. One of the things I do is I do lots of TV and radio interviews. And I’ve gone really pretty good at being quick on my feet and being able to have a good rapport with who ever is talking with me. And that’s – people notice that when they’re watching an interview – you notice whether someone feels comfortable or not, whether someone is answering the question or not. Now there are also skills I’ve learned about how if I want to cover a certain subject I can sort of manipulate the interview so that I can sort of answer the question, but really segue into what I want to talk about. But that’s a skill too – being an author is a form of entertainment and every entertainer needs to promote him or her self some way, and to be good at that is just going to add to your creditability and add to your wallet in the long run. Luber: So then in addition to being a good writer you’ve mentioned that there are many skills that you need and you also mentioned that luck and timing play a big role. So someone who’s out there who’s just a good writer doesn’t necessarily mean that their whole career is going to come together for them. They have to have all these other skills and they have to have luck and timing. They have to have the whole broad picture there right? Guest: Yeah. Be very lucky. That would be the #1 skill you have to have. Yeah there are lots of really good writers out there who have not yet been published. Lots of them. And there’s lots of mediocre writers who have books that for some reason they become best sellers. And that’s frustrating to the writers who haven’t been published, believe me. And it’s frustrated people like me, who think of themselves as a decent writer who haven’t really hit the big time yet. So there is a lot of luck involved. As I said before you make your own breaks in life and sometimes you just have to put yourself in the position to be lucky. And that can go a long way. Luber: Yeah for sure. Tell us this -some people watching are in high school, some are going to be in college, some are already done with school – they just have a passion- they want to be a writer. In some cases it might be a parent watching on behalf of their kids trying to figure out what should Johnny or Jenny do one day? So give some advice on if someone wants to get started now. Whether they are any of those phases in life. They’re interested in doing what you do, or one segment of what you do. What should they do today? What can they start doing right now to move towards that kind of a career path? Guest: Well, first off, if you are in high school, just be a nice guy, OK? When you go back to your high school reunion 20 years later, if you were a nice guy people will want to talk to you. If you weren’t, you will be standing alone in the corner. But I think if you are in high school, read a lot of books. If you want to be a writer someday, read lots of books. You don’t even realize when you read a novel or book your understanding of how to write well is growing, and growing and growing, your understanding of how to craft sentences, your understanding the rhythm of sentences and words. How to turn sentences into paragraphs, how to combine those paragraphs into a chapter, how to combine those chapters into a book – and just understanding how to do that. So a lot of it is craft-oriented when you are younger. Just learn how to write well. And also learn what you might want to be writing about. What you might be good at. It does help to be comfortable with a subject when you’re first starting to write so if you write – when you are 15 years old and you love nature and are passionate about the state of the environment, you can start writing about that and there are outlets for that out there. And in college too the same thing- when you’re starting out as a writer, don’t expect to dominate the world right after off the bat. It doesn’t usually work that way. You have to start – you have to be realistic about your expectations. Your aspirations can be off the charts. But your expectations should be realistic – and as I said before- if you want to write for a certain magazine – I always wanted to be a Sports Illustrated writer – I ended up writing 8 or 10 things for Sports Illustrated. But they weren’t the 7 page stories about the Superbowl. They were the little 1 or 2 page stories at the beginning of the magazine about querky, interesting, sporting activities or fetes or people, and stories that haven’t been told. That’s what I always try to write about and I think that’s what people should seek out too. Try to figure out what’s a good story – not only how to tell a story well but what makes a good story that hasn’t been told yet. I tell people that if they want to write books today, if they see that vampire books are hot right now, I recommend not writing a vampire book because by the time that book ever gets published, there’s something else that’s hot. It’s that way in the movie industry too. And the music industry too. So tell the story that hasn’t been told. Tell it in your own way and figure out your own voice as a writer when you’re a young writer. Don’t borrow somebody else’s voice as a writer – you need to develop your own – which is easier said than done. But make sure you are your own person – and that you come through in the writing. Between that and a good idea and hard work and a little bit of luck and timing, you can make it work. Luber: Would you say those are your keys to your success? Guest: Those are my key to success. Hard work, good ideas, little bit of luck, little bit of timing. And making sure that if you’re doing something artistic that you’re perfecting a craft as well as the commerce of what you are trying to do. Luber: Excellent. Very good advice. As always everyone at Careers Out There you get real advice from real professionals like Brad Herzog here. Brad thank you so much for joining us at Careers Out There. Guest: My pleasure Marc Luber. Luber: Everyone let us know what did we cover well, what did we not cover enough. What would you like to know more about? Let us know by showing your feedback there on the site in the comments section. Also make sure to sign up with your email address at the top of the home page. Thank you all for watching. I’m Marc Luber and we look forward to seeing you again soon. Take care.